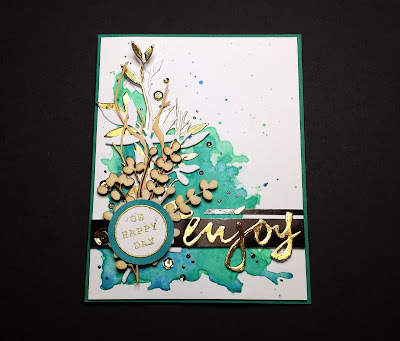 I loosely painted and splattered the background with my Kuretake Gansai Tambi watercolours and then had fun layering die cuts and wood veneers to create the focal point. 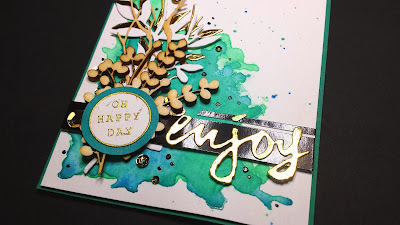 I had to cut up my clear stamps to create the 'Oh happy day' sentiment for the faux flair embellishment, and deliberately let the gold embossing get a little messy to go with the overall artsy feel of the card. 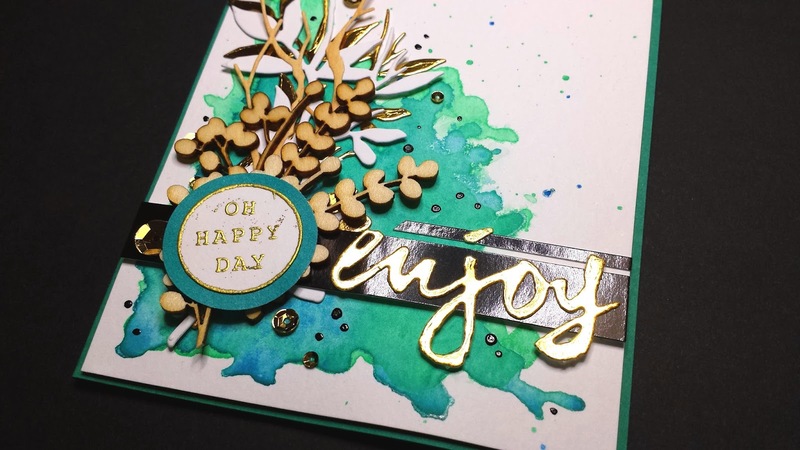 The 'enjoy' sentiment was die-cut from gold foil cardstock and adhered to some glossy black cardstock, then a few gold sequins and black drops from a Pico embellisher were scattered around the card. I love this refreshing colour combo, it makes me happy! This is such a beautiful card, Alyson! Your use of colour and texture is sublime. Thanks for joining in the fun at Just Add Ink this week! This is gorgeous Alyson! I love the bold and arty background and all the wonderful foliage layers with its glints of gold. Thanks for joining us at Just Add Ink this week. WOW! Your card is stunning! Looking at it makes me happy too :) Thanks for sharing it with us at Just Add Ink. This is one AWESOME card! Congrats on your win - well deserved! Gorgeous! Love the colors, the touch of gold... the layering is amazing.